Four members of the Caledonian MacBrayne ferry fleet have been lying at Rosneath over the holiday period. Berthed on the outside of the pier is JUNO, which has been there since she was withdrawn in April 2007, while SATURN - spare during the winter months - lies alongside her. 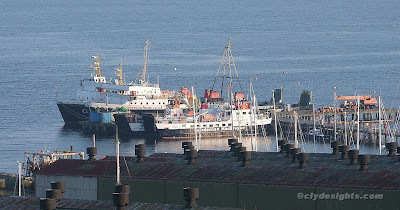 On the inner side of the pier are two of the smaller ferries: ISLE OF CUMBRAE has been laid up at Rosneath since October, while LOCH BUIE, normally used on the short crossing between Mull and Iona, joined her a few days prior to Christmas. LOCH BUIE is due to return to her regular route in the next few days. Interesting to see what appears to be a surplus Loch class vessel. I was of the belief that one of these, or similarly sized, vessels would be taking over from the Eigg on the Oban-Lismore route. Its gone a bit quiet on that front, anyone know anything?